A psychological western, in which reformed gunfighter Steve Sinclair (played by an aging Robert Taylor) has to deal with his increasingly squirrelly and gun-happy much younger brother Tony (John Cassavetes). 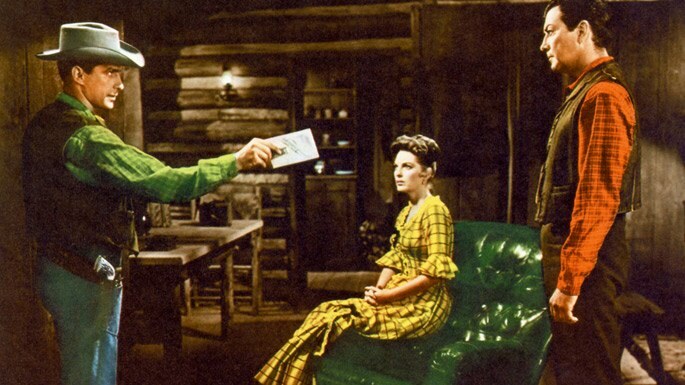 The Sinclair ranch is one-third of a mountain valley, with the rest belonging to Dennis Duneen (Donald Crisp, in his old-bull-of-the-range mode, as in The Man from Laramie, but here with anti-violence principles). Tony shows up at the ranch with Joan Blake (Julie London), a dance hall girl, as his announced fiancée. Tony shoots down Larry Venables (Charles McGraw, wearing a very 1950s name for a gunfighter), who has come seeking Steve, and things go downhill from there. A group of range squatters with title to a strip of land announce their intention of fencing off their strip, leading to confrontation between those now using the range and the squatter leader Clay Ellison (Royal Dano), who seems none too mentally stable himself. Eventually, Tony shoots Ellison and is banned from the valley by Duneen. He confronts Duneen, and both are shot in the exchange. Steve has to go after Tony now, and as they face off Tony shoots himself so Steve won’t have to. The implication at the end is that Steve and Joan end up together. The end is fairly abrupt. The question from the start is not what will happen, but how will it happen. The Joan Blake role, played by Julie London, is underwritten and pretty much extraneous. There is a good supporting cast, including Crisp, Dano and Ray Teal. 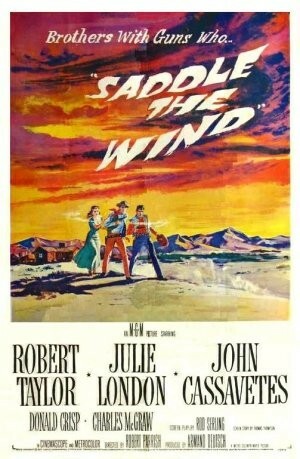 This is notable for a rare screenplay by Rod Serling, creator and writer of television’s The Twilight Zone; it’s his only western. This is one of several westerns made by singer Julie London during a short period in the late 1950s, along with Drango, Man of the West and The Wonderful Country (also directed by Robert Parrish). She seems a little glossy for westerns, usually playing a former or current saloon girl. This is not quite as good as Taylor’s The Law and Jake Wade released the same year, but it’s still watchable. Score by Elmer Bernstein. Filmed in Colorado. In color. 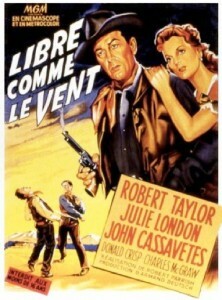 This entry was posted in Westerns Worth Watching and tagged Julie London, Range Wars, Robert Taylor on March 5, 2014 by Nicholas Chennault.